Samsung Electronics is showcasing three secret projects from their C-Lab innovation program for the first time at SXSW 2016. The cat is out of the bag. Samsung revealed a mobile app, social media network and set of headphones – all created by Samsung employees in their C-Lab. Started in 2012. C-Lab is a startup that helps employees develop their own creative businesses. The three projects include Hum On!, an app that transforms hummed melodies into music; Waffle, a social media concept based around content-creation and sharing; and Entrim 4D, an accessory for the Samsung Gear VR that will allow users to feel events from on-screen. All projects are still in development and are on display to access market viability and get feedback from SXSW’s tech savvy attendees. Hum On!, currently in development on Android, allows anyone to hum a tune into their phone and it will convert the vocals into a musical score. Tunes can then be played back, rearranged and shared in a matter of minutes. Once recorded and arranged, the app will play the tune back to you in your preferred musical style whether that’s rock’n’roll, Hip Hop or Classical. You can totally share your songs via social media or torment your friends and family by playing them a never ending selection of your latest recordings. The app uses software designed to analyze a user’s voice, detecting pitch and duration and use’s machine learning to make accompanying melody similar to a real musician. Using a simple user interface Hum On! is easy to use and easy on the eye. The C-Lab team are currently looking to partner with musicians to improve the app and will also focus on improving recognition accuracy for the software at the core of the project. 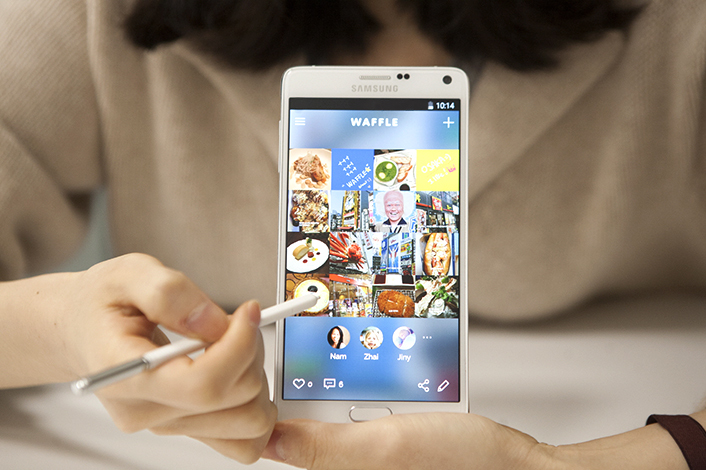 Samsung has joined the world of social networking with their new offering, Waffle. Based on the concept that social media feeds are filled with photos and videos that are mostly unrelated, Samsung have built Waffle to generate collaborative stories based off multiple points of view from related users. Named after the grids of images assembled by users, the app allows the original creator to post into the center square, and other users post their take using the surrounding squares of ever expandable content. Billed as community curated content, Samsung wants to allow users to fill the grids with photos, videos and even drawings related to the original post, creating multiple points of view from other people’s perspectives. There is no argument that VR is a technology seeing explosive growth and as new headsets come on the market it takes something different to standout. That’s where Samsung’s new Entrim 4D headset comes in. Adding another level to the immersive experience of VR, the new Samsung headset uses a smart combo of computing power and a technology sounding like something out of Star Wars, Galvanic Vestibular Stimulation or GVS, to send electronic messages to a nerve in the ear. Designed to synchronize your bodies senses to the movements inside the video, the headphones make use of similar electrodes to those employed to help stroke patients recover balance after a stroke and combine it with complex algorithms calculated by engineers from the motion data. The Entrim 4D team of engineers are aiming to build an unparalleled VR experience and have tested the headphones on over 1500 people so far creating over 30 different patterns of movement. Trying to overcome one of the most difficult aspects of VR, that to have a truly immersive experience you need to feel not just to see, users can feel like they are a part of the experience not just an observer. For example, when paired with a drone, and linked to the drone’s motion sensors, the headphones will give the user a sensation of flying. Though still only in the development cycle, the Entrim 4D shows a lot of potential in overcoming some of the early barriers in VR to create a deeply captivating experience. See all three projects on display between March 13 and 16 in Exhibit Hall 2 of the Austin Convention Center in Austin Texas. Also look for a Veloxity charging kiosk.